Lisbon Lions 1967 Celtic Shirt signed by 7. 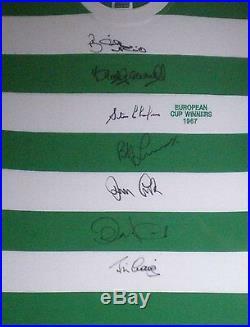 Personally Signed by: Billy McNeill, Steve Chalmers, Bertie Auld, Tommy Gemmell, Jim Craig, John Clark and Bobby Lennox. This tribute shirt comes signed by 7 of the Lisbon Lions celebrating Celtics historic European Cup win in 1967 a 2 v 1 win versus Inter Milan making Celtic the 1st ever British team to lift the European Cup with a Certificate of Authenticity and is a very rare item to see with 7 original signatures from the Lisbon Lions. The Lisbon Lions is the nickname given to the Glasgow Celtic team that won the European Cup at the Estádio Nacional in Lisbon, Portugal on May 25, 1967, defeating Inter Milan 2-1. All the members of this team were born within 30 miles (48 km) of Glasgow, Scotland. Celtic’s style was the antithesis of the cynical, but highly effective, defensive style of Internazionale. Jimmy Johnstone described the team’s style as like the Dutch speeded-up. Alessandro Mazzola opened the scoring for Inter with a 7th minute penalty, after Jim Craig brought down Renato Cappellini. The Italians then retreated into their famous 11-man defence. Inter did not win a single corner and forced Celtic goalkeeper Simpson to make only two saves; Celtic had two shots off the crossbar, and 39 other attempts on goal, 13 of which were saved by Italian goalkeeper Sarti, 7 were blocked or deflected, and only 19 were off-target. Craig made amends for his penalty mistake on 63 minutes, when he laid off the ball for Tommy Gemmell to fire home for the Celtic equaliser. With 83 minutes on the clock, Gemmell was allowed space, and he played the ball to Bobby Murdoch, whose long-range shot was deflected by Steve Chalmers past Giuliano Sarti into the net. 2-1 to Celtic, final score. Celtic were the first British club, and the first Northern European club to win the European Cup and are still the only Scottish club ever to have reached the final, and are the only club eligible to win a “Quadruple” to have done so. They reached the final again in 1970 but were beaten 2-1 by Feyenoord after extra time in the San Siro Stadium in Milan. Heroes Memorabilia are an AFTAL registered dealer #175, AFTAL are an organisation working in co-operation with the Police Force & The Trading Standards Authority to stamp out Fakes & Forgeries. Our aim is to bring you the best memorabilia available at all times. Dont hesitate and miss out on this once in a lifetime opportunity, you will see this valuable piece of memorabilia turn into an instant investment. All the autographs shown were either obtained in private signing sessions or through trusted dealers. The item “Lisbon Lions 1967 Celtic EC Winners Shirt Hand Signed by 7 AFTAL RD#175 Unframed” is in sale since Monday, May 15, 2017. This item is in the category “Sports Memorabilia\Football Memorabilia\Autographs (Original)\Signed Shirts\Retired Players”. The seller is “heroesmemorabilia2007″ and is located in Nottingham. This item can be shipped to United Kingdom, Antigua and barbuda, Austria, Belgium, Bulgaria, Croatia, Cyprus, Czech republic, Denmark, Estonia, Finland, France, Germany, Greece, Hungary, Ireland, Italy, Latvia, Lithuania, Luxembourg, Malta, Netherlands, Poland, Portugal, Romania, Slovakia, Slovenia, Spain, Sweden, Australia, United States, Canada, Brazil, Japan, New Zealand, China, Israel, Hong Kong, Norway, Indonesia, Malaysia, Mexico, Singapore, South Korea, Switzerland, Taiwan, Thailand, Bangladesh, Belize, Bermuda, Bolivia, Barbados, Brunei darussalam, Cayman islands, Dominica, Ecuador, Egypt, Guernsey, Gibraltar, Guadeloupe, Grenada, French guiana, Iceland, Jersey, Jordan, Cambodia, Saint kitts and nevis, Saint lucia, Liechtenstein, Sri lanka, Macao, Monaco, Maldives, Montserrat, Martinique, Nicaragua, Oman, Pakistan, Peru, Paraguay, Reunion, Turks and caicos islands, Aruba, Saudi arabia, South africa, United arab emirates, Ukraine, Chile.